The guys over at the A-Z Challenge would like all the participants to do a reflection post. Well, Ive kinda done that already, when I did my Cast List post a couple of days after finishing. What were the highlights of my April Challenge? What changes i might make next time? Special bloggers i met in my A to Z journey or a post/posts that especially moved or impressed me? This entry was tagged A-Z Challenge, Blogging From A-Z Challenge, Characterisation, characters, Writer, Writing. Bookmark the permalink. Don’t stay under that rock too long, I want you writing that book dammit! I might have to participate. Maybe combine it with poetry month and work it that way. You did a great job and I enjoyed reading your characters descriptions. I admire you for getting it all done, and for providing such excellent characters. I tried to read everyone I could catch up on, and I liked them all. I hope you will expand some and maybe write some stories with some of the characters or poems. Whatever floats your boat as I used to say. Great job!!!! Pats on the back are well-deserved! I will definitely be using them Rebecca, for Nano 2012. I loved reading your characters–even got a few ideas for my own work. I popped over to Stuart’s site and will return to read all his posts. 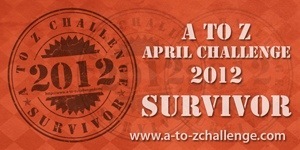 I’ve checked out the A-Z Challenge–looks very cool. Next year? I’ll be there. Thanks, Vikki! I think Stuart is removing his stories at the end of May because he wants to publish them, thinking of doing the same with my characters. Though you did more than just survive, you excelled! You had such a great cast of characters. I might (strong emphasis on MIGHT) participate property next year. We’ll just have to see what’s going on at that time next year. I’m trying to get a little more of a buffer going with blog posts also. Again, great cast!! You did a fantastic job with that challenge, and I was continually impressed with all the characters that you introduced me to! It sure is something to think about though.